SHARM EL-SHEIKH, Egypt -- A Russian passenger airliner crashed Saturday in a remote mountainous part of Egypt's Sinai Peninsula 23 minutes after taking off from a popular Red Sea resort, killing all 224 people on board, including 25 children. Russia's top aviation official says the plane had broken up at high altitude. Alexander Neradko, head of the Federal Aviation Agency, said the large area over which fragments of the plane were scattered indicated that it disintegrated while flying high. Neradko wouldn't comment on possible reason for the crash, saying the probe is ongoing. 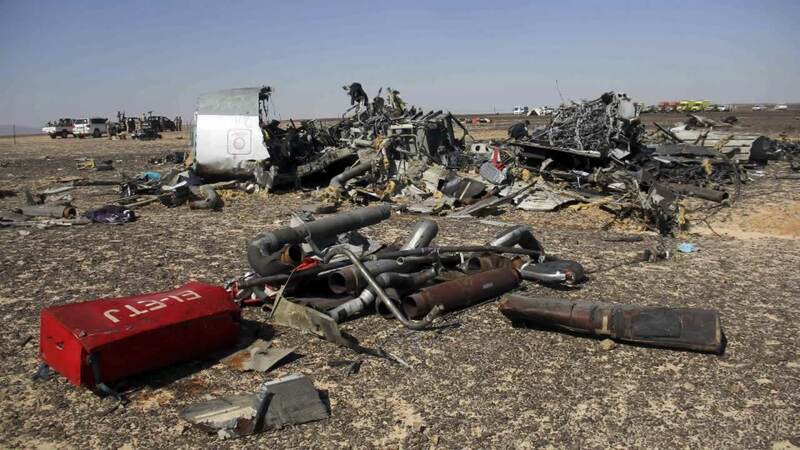 Neradko is in Egypt to inspect the crash site along with two Russian Cabinet ministers. British Prime Minister David Cameron has told Russian President Vladimir Putin that Britain shares the "pain and grief" of the Russian people after the crash of a Russian passenger jet in Egypt. Cameron's office said he spoke with Putin on Sunday morning and offered to aid the investigation into the cause of the crash Saturday that killed all 224 people on the Metrojet charter flight from Sharm el-Sheikh to St. Petersburg. He told Putin that Britain stands ready to help if needed. Cameron's office said Putin thanked him for the offer but said Russian investigators were already at the crash site in Sinai. They are working with Egyptian, French, German and Airbus investigators.